Fast forward a hundred years, the internet came around; making video calling and video conferencing, a revolutionary tool for the general public. As the internet matured and became faster and cheaper, video conferencing has taken full shape. Want advice from your friend while shopping? A video call is just a few taps away! Job interviews, consultation, brainstorming with co-workers who live on the other end of the world- video conferencing has changed the way we communicate and interact with one another. Around 3.3 million Americans say that they work from home. Not only that, but it’s now possible for people to work on a collaborative project from anywhere in the world and it’s increasingly becoming the norm. All thanks to a lot of cool Saas tools out there. Video conferencing tools play a big part in making remote work, work. Telecommuters can easily run down ideas with one another by hopping onto video chat without the hassle of back and forth email. 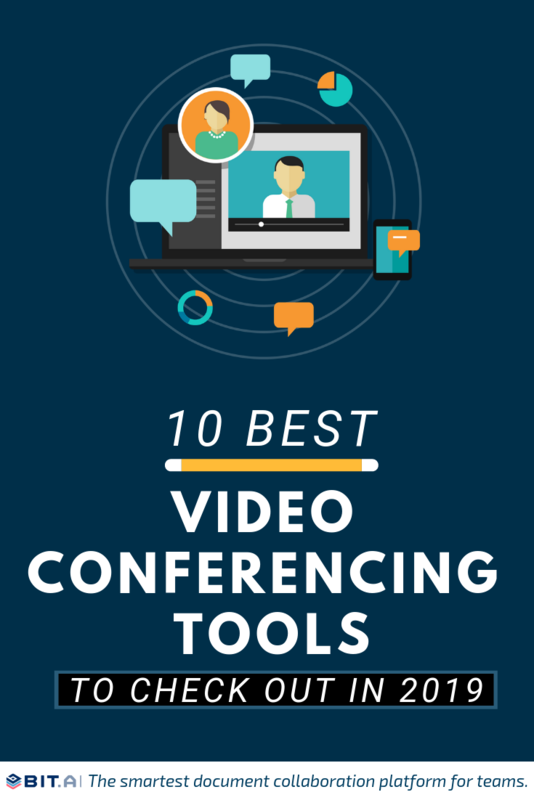 Teams can brainstorm ideas, hold meetings, and keep check on each other work as well as personal well being- all thanks to the awesome video conferencing tools available on the market right now. Let us kickstart our list by first getting the most famous video conferencing tool out of the way. Skype, owned by Microsoft, is a widely popular telecommunication app that lets you chat and video call with anyone all around the world. Been around for over 18 long years, Skype is the go-to communication app for millions of teams worldwide. Apart from video conferencing, Skype also offers screen sharing capabilities which allow users to share screens with each other while they are on a call with one another. Users can even share photos, videos, and files up to 300MB over Skype and quickly find shared content in the chat gallery. Zoom video communications were named a 2018 Gartner Peer Insights Customers’ choice for meeting solutions! Whether you want to conduct an online meeting, video webinar, or just need to share screens with your IT team, Zoom is the tool for you. If you have a large team with whom you share screens or conduct meetings, Zoom is the go-to tool. Its free account option lets you share screens with up to 25 participants and host an unlimited amount of meetings. However, each meeting can be only 40 minutes long. Apart from screen sharing, Zoom also provides cross-platform messaging and file sharing, which can be a welcome addition to simple screen sharing. The new age Skype, Slack has quickly gained massive popularity amongst startups and remote teams. With over 8 million daily active users (3 million of which are paid users! ), Slack is the go-to communication app for businesses nowadays. Slack allows teams to create chat groups called ‘channels’ for transparent, open communication. Apart from messaging, Slack also allows group video conferencing and screen sharing to conduct meetings more effectively. Up to 15 people can join in together on calls, which should enough for most businesses out there. In a short amount of time, Slack has gained significant popularity with over 35,000+ paid companies like IBM and Airbnb. Slack also offers apps for iOS and Android to keep the communication going wherever you go. A new kind of video conferencing tool, Loom helps you get your message across through instantly shareable videos. Loom lets you record videos for any business purposes- whether you want to record a detailed video response to an email, share a video response to a customer question, embed video tutorials on your website, share quick videos on social media, etc. When you record a video using Loom, the video will be automatically saved to your video library. Apart from recording videos, you can also conduct a screen capture video and have the option to include your face in a small bubble at the bottom of the screen. This allows you to quickly address a lot of business situations where a text response just doesn’t cut it! A browser-based video conferencing and screen sharing tool, Mikogo doesn’t require any downloads. Users can easily connect via a web browser and start using the tool in no time!. Mikogo offers high-quality video and voice conferencing to conduct an online meeting with your clients or team members. There’s even a “Session Scheduler” to schedule your meetings in advance, so you never miss a beat. Apart from the web browser, users can also video call via Mikogo’s iOS and Android mobile apps or their mobile’s web browser. Mikogo offers a free account, available at absolutely no cost to both private users and businesses. Hangouts Meet is a newer, cleaner, upgrade to Google’s Hangout app for texting and video calling. Designed especially for business meetings, Meet takes the headaches out of joining a video call at work. Just set up a meeting and share a link. No worrying about whether teammates, clients, or customers have the right accounts or plug-ins. With a fast, lightweight interface and smart participant management, multi-person video calls are a breeze with Meet. Since Meet is fully integrated with G Suite, you can join meetings directly from a Calendar event or email invite. Users can also easily share files with teammates from Google Drive or other Google apps seamlessly. Easy video meetings for your business. If you want a quick and simple video conferencing tool to quickly jump into meeting with someone, Appear.in might just be the tool for you. Just open your browser, create your own meeting “room”, share the link on Slack, Skype or email and voila- up to 4 people can join in the call for free! If you want more people to join the meeting simultaneously, you’re going to have to buy the PRO plan. The best part is that guests won’t have to register to join. Just send them the room link to join in the browser. You can even make the meeting room private so guests have to ask for permission before joining in on the call. If you have a big business and want to conduct video meetings on a large scale, you should check out ClickMeeting. A browser-based, feature-heavy video conferencing tool, ClickMeeting help businesses and teams to collaborate and work online effectively. Users can host team conferences and sales meetings with up to 25 attendees and broadcast up to 4 video streams, discuss, share presentations and media files. You can easily scale from 25 to 5000 attendees, perfect for those who want to conduct webinars. ClickMeeting is easily customizable, meaning that businesses can add their own color, font, and logo to match their brand aesthetics. 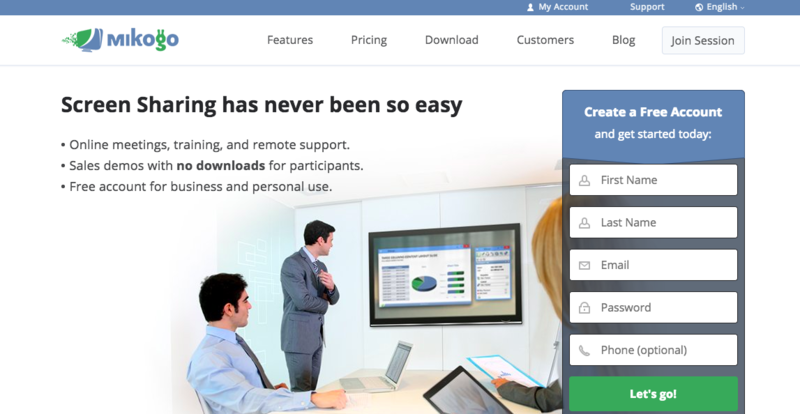 With ClickMeeting’s API, users can connect it to their own platform or any CRM platform. If you have worked in support, we are sure you’ve heard of Teamviewer. This video conferencing and remote screen sharing tool has been around for a while, leading to its massive popularity amongst teams. Around 400,000+ download Teamviewer software daily, conducting 40 million+ sessions daily! Used mainly for providing support to customers and clients, Teamviewer has a ton features up its sleeve-including video conferencing. Both remote access and remote conferencing sessions are supplemented with HD-quality voice over IP calling solutions. Teams can even collaborate on a digital whiteboard while calling or record sessions for future reference. Teamviewer is an all-in-one collaboration solution, which can be both a good or a bad thing depending on your use cases. With 18 million users worldwide, GoToMeeting is a great tool for businesses looking for a professional way to conduct video conferences and webinars. Video conferencing tools has enabled remote work significantly. With browser-based tools allowing you to quickly hop into a meeting with a co-worker and collaborate, video conferencing tools are nothing short of a blessing to businesses worldwide. Each tool serves a different purpose- some allow you to make quick calls while others provide full-fledged collaboration solutions. With free-trials available for almost all tools, you can test the waters and see what works best for you and your team. Happy calling!